Mix all ingredients in a saucepan using a whisk. Cook the mixture on a low heat. The mochi starts to become very sticky so mix it with a spatula. Cook until the mochi becomes a little transparent (not completely, but looks transparent compared to the beginning). Also, taste a bit to check it’s cooked well. If it tastes powdery, you need to cook longer. Place potato starch on a tray and spread it around. We use the starch to prevent sticky mochi sticking everywhere, including your fingers. 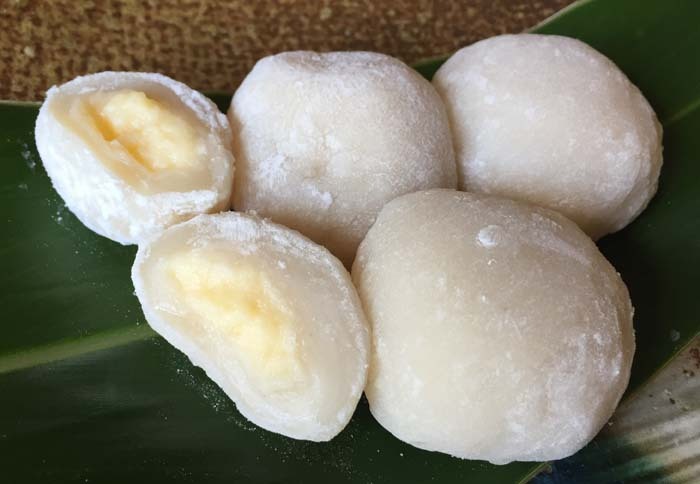 Sprinkle the potato starch on the mochi dough and take 2 tablespoons-worth of the mochi dough. Flatten the dough on your palm and place 1/2 tablespoon custard filling in the middle. Wrap the dough around the filling and pinch the edges together to completely cover the filling. Place the mochi daifuku with the joints facing down.